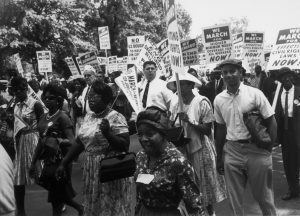 Wilmington, N.C. –Changing America: The Emancipation Proclamation, 1863, and the March on Washington, 1963, a traveling exhibition opening at Cape Fear Museum on November 5, 2017 examines the relationship between two great people’s movements that resulted in the Emancipation Proclamation in 1863, and the March on Washington in 1963. Both grew out of decades of bold actions, resistance, organization, and vision. One hundred years separate them, yet they are linked in a larger story of liberty and the American experience – one that has had a profound impact on the generations that followed. Changing America: The Emancipation Proclamation, 1863 and the March on Washington, 1963 is presented by the Smithsonian’s National Museum of African American History and Culture and the National Museum of American History in collaboration with the American Library Association Public Programs Office. The exhibition is made possible by the National Endowment for the Humanities (NEH) and is part of NEH’s Bridging Cultures initiative. Cape Fear Museum is offering the following programs in connection with the exhibition. Visit www.capefearmuseum.com for more information. Changing America will be on view through December 15, 2017. Enjoy an uplifting selection of songs from the 1860s to the 1960s with the Williston Alumni Community Choir, directed by Marva Robinson (Performance from 3:30 until 4 PM). Light refreshments will be served. Come early to view the exhibition before the choir performs. What do freedom and equality mean and how has their meaning changed over time? Hear three scholars discuss these questions in the contexts of the 1860s, 1960s, and today. Then join in the conversation. What’s Wrong With Different?, a national hallmark racial justice program developed by the YWCA Lower Cape Fear, uses a hands-on approach to teach children to value, appreciate and respect the differences between people. Suitable for ages 7-10. Pre-register at: www.capefearmuseum.com/programs or call 910-798-4362. After a brief introduction of the landscape of the 1960s Civil Rights movement, hear from local participants in the march in DC, and those who worked to change the segregated south by protesting and working in the community. Experience this powerful and accessible production by Bright Star Theatre Company. Take a journey through African American history and the meaning of freedom through famous speeches, powerful hymns, and meaningful poetry. Space is limited. Pre-registration is required: capefearmuseum.com/programs or 910-798-4362.